Endowments are donations in perpetuity designated to a specific part of an organization as decided upon by a donor. 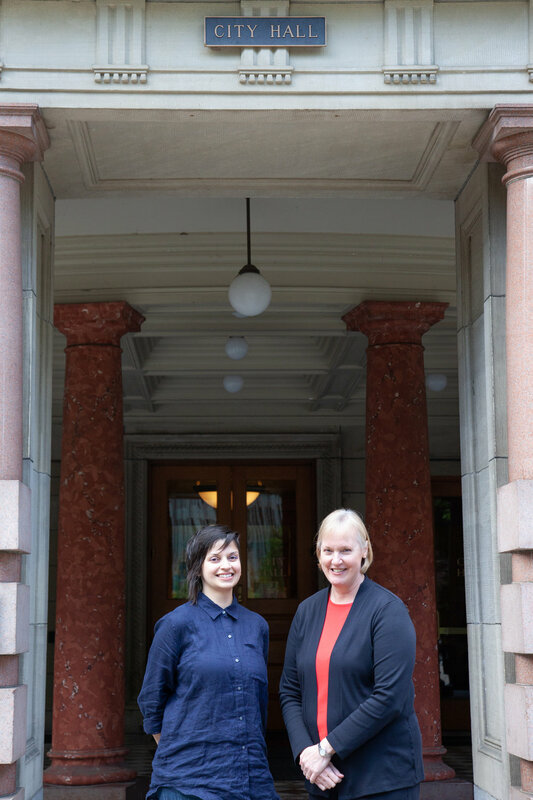 For Exchange Endowments, artists in select cities around the United States are endowing funding to their local city hall for a once-a-year lunch conversation between a government employee and a local artist. Visit ExchangeEndowments.com to learn more. Mary Hull Caballero is the elected Auditor for the City of Portland, taking office in January 2015. She previously worked as a performance auditor at Metro Regional Government in Portland and the Oregon Department of Transportation. Prior to entering the auditing field, Mary co-founded and managed a public policy leadership development organization and was a newspaper reporter. She holds a Master's Degree in Public Policy and Management from Carnegie Mellon University. She received her undergraduate degree in Communication from Lewis and Clark College. Mary is a Certified Internal Auditor and a Certified Government Auditing Professional. Roshani Thakore is interested in using collaboration with artists and non-artists to examine, redefine, and envision new identities and environments through mediums such as drawing, painting, photography, video, movement, processions, storytelling, protests, dance, design, and more. Her work is site-specific; her last body of work was developed in Queens, New York – the most diverse place in the nation and one of the pioneering places for socially engaged practice. While her time in New York, she studied with Andrew Ginzel, worked with the Queens Museum under Tom Finkelpearl’s stewardship, volunteered at Immigrant Movement International, and was part of the South Asian Women’s Creative Collective. In 2018, she will be the Jade District Contemporary Artist in Residence through the APANO and Division Midway Alliance Creative Placemaking Projects Grant, and will collaborate with Anke Schuettler and the Free Mind Collective for the project Answers Without Words, funded by the Portland Institute of Contemporary Art’s Precipice Fund.